Summer is almost here for many of us. It’s a great time to relax, recharge, and reinvigorate our passion for education. I love using my summers to explore creative ideas that I haven’t gotten to throughout the school year. Sometimes, as educators, we can forget what it’s like to be a learner. So this summer, take a class! Get a book on that DIY project you’ve been wanting to try. Learn how to do something new. Local makerspaces and hackerspaces are great for things like this. You can learn anything from soldering to programming Arduinos to knitting. There’s tons of great online programs as well, but I recommend finding an in-person class if you can. It’s a great way to meet other makers in your area and network. I’ve got plans to take some weaving classes at Make Me Studio because that’s a skill I’d really like to improve and maybe bring into my maker program next year. Hopefully, there’s an art, science, or children’s museum in your area (or all three!). If not, maybe there is one nearby somewhere you’re traveling to. Go visit some museums, explore the exhibits. Look for ways that you could take ideas from their programming and apply them to your own library. Bonus – look for summer PD programs at art, science, and children’s museums! Many museums often have summer workshops for educators and they can be amazing opportunities. If you’re going to the ALA Annual Conference in New Orleans, be sure to check out the New Orleans Museum of Art and the Louisiana Children’s Museum. If ISTE is your game, check out The Art Institute of Chicago, The Field Museum, or The Museum of Science and Industry Chicago. If you can, take the opportunity to make a creative projects with some kids. If you have kids of your own – awesome! Make some fun summer projects. If you don’t have kids (or they’re too young or too old) borrow someone else’s (with permission, of course). Try making something from the Big Book of Makerspace Projects. Or grab a bin of LEGOs and build together. Learn how to make slime and get messy. Read a book on creativity. 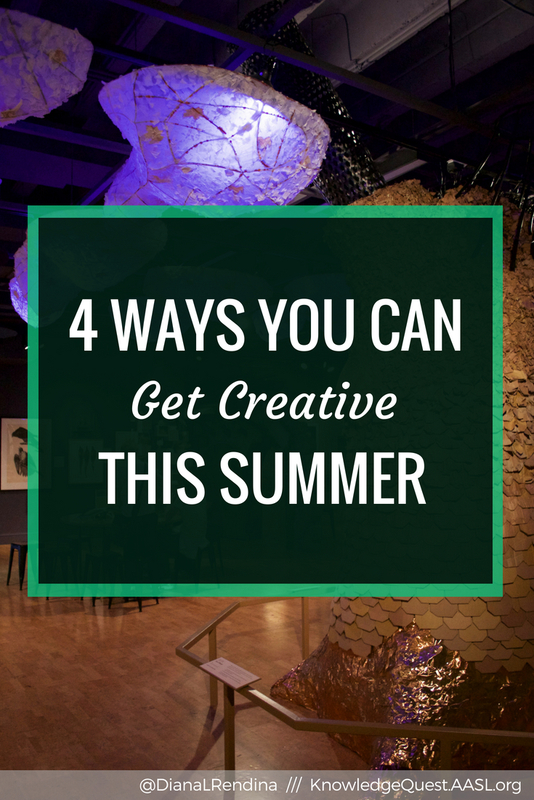 How do you stay creative over the summer? Tell us in the comments. ‹ Why blog in 2018?